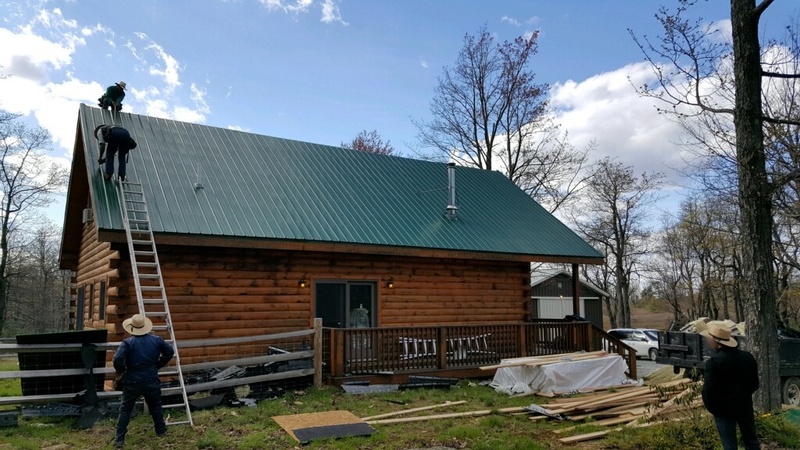 This newly built log cabin had very poor indoor air quality. I always felt sick after spending the night. The air inside felt thick and reminded me of a slight sting when inhaling. My muscles would ache and feel cramped up with an upset stomach. The longer we stayed the more symptoms would come on and the sicker I felt. A handful of people who stayed also felt something was not right, while others seemed to not notice. This beautiful log cabin that sits on top of a mountain was lacking the mountain fresh air. Even on the porch I could feel the poor air coming from the roof vents. When I discovered my sensitivity to fiberglass I knew it all had to be removed from the cabin. Luckily the walls were thick solid wooden logs which did not contain fiberglass. 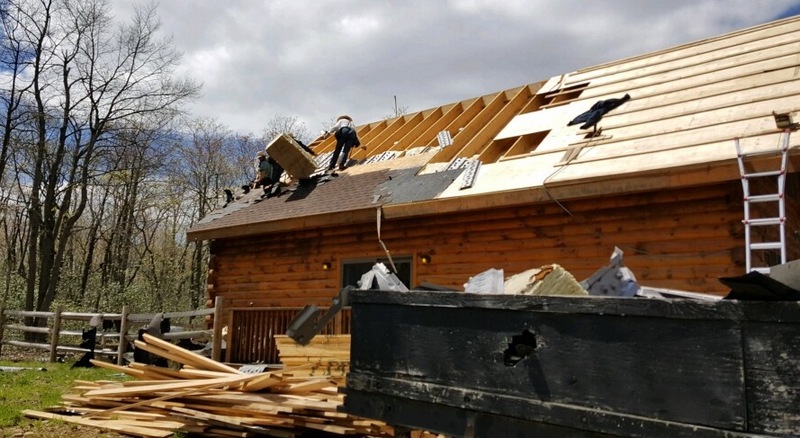 Fiberglass however was in the roof shingles along with thick batts under the roofs plywood and fiberglass flex ducts in the basement. It all had to go. 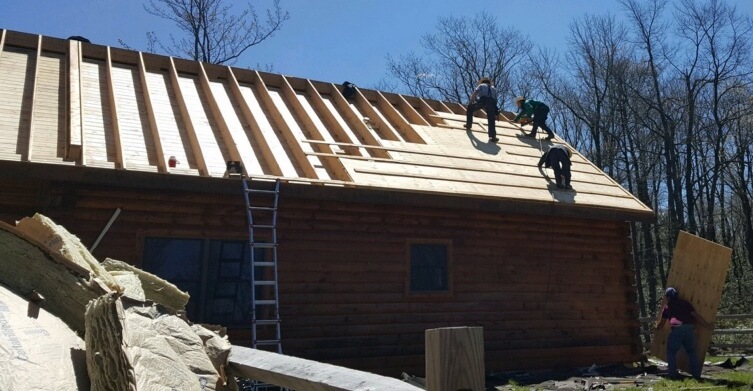 The shingles were scraped off, the plywood was taken up and the thick fiberglass batts were removed. 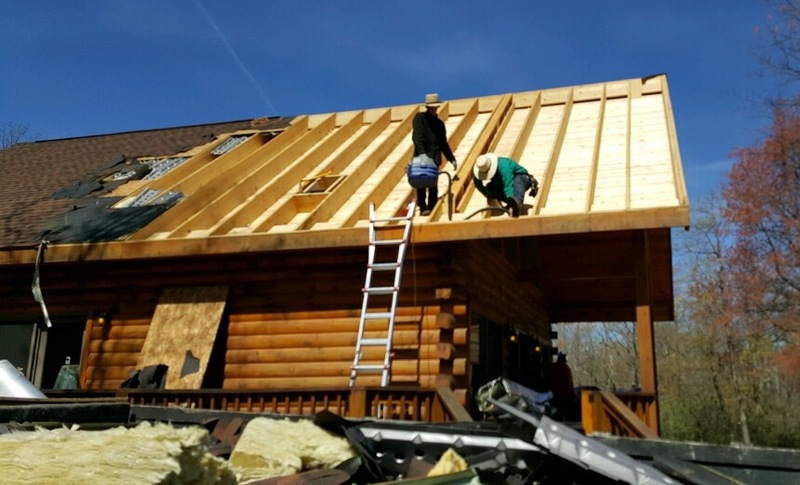 Pulling out the fiberglass batts from the log cabin roof. 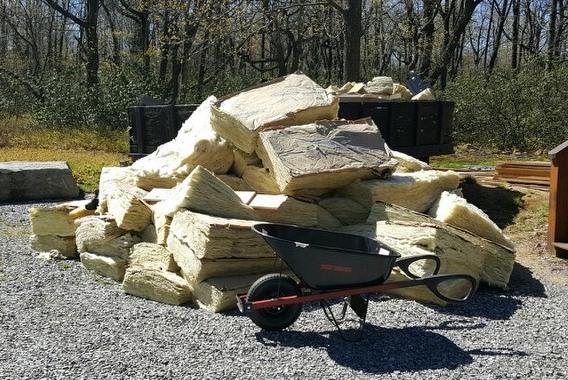 A pile of 12 inch R-38 fiberglass that was removed from under the log cabin's roof. 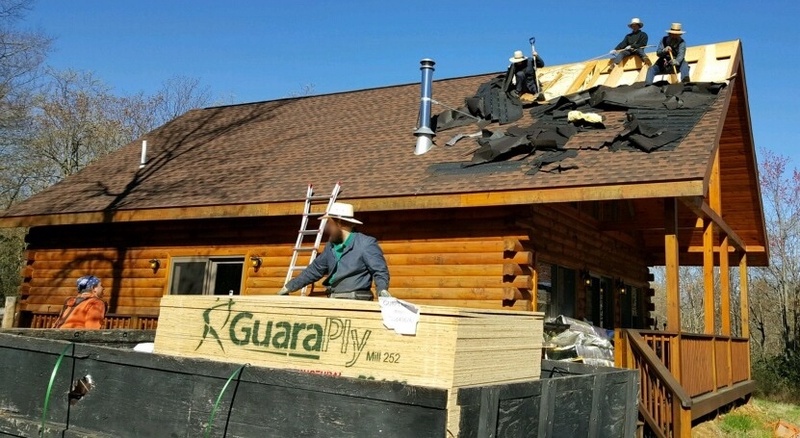 The roof shingles being removed from the other side of the cabin with piles of fiberglass on the ground. Putting new plywood back after the batts were removed. Checking over the roof and making sure no pieces of fiberglass are left behind before the plywood goes back on. 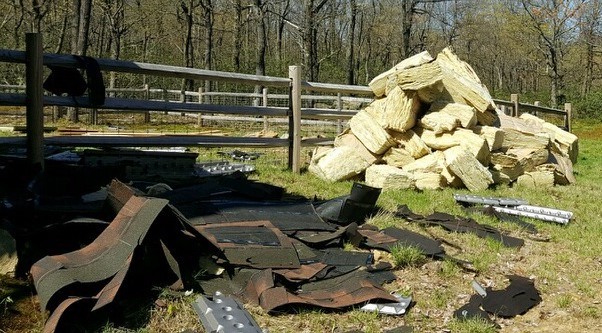 A large pile of fiberglass and a pile of fiberglass based roof shingles. This yard is going to have to be thoroughly cleaned up. 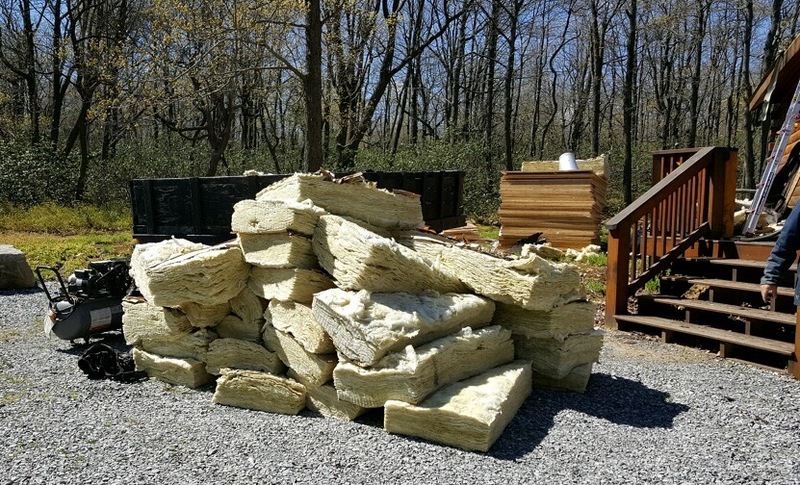 Piles of fiberglass that were removed from under the roof. Putting the plywood back after the bays have been cleaned. 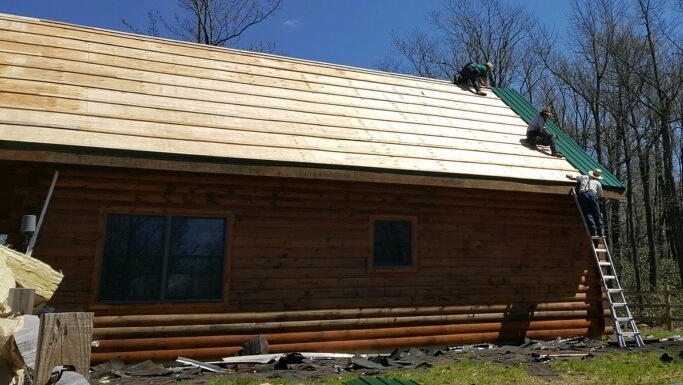 We decided to go with a green tin roof. We had to make sure no material containing fiberglass was put back on under the tin. The green tin going down. Eagerly waiting for an empty dumpster to show up so those fiberglass batts and fiberglass based shingles can be taken away. 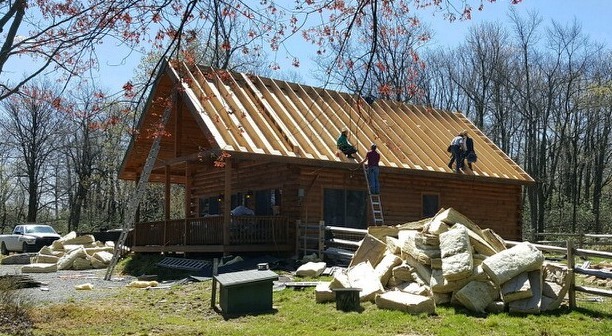 This will most likely be the last time this cabin will need a new roof in my lifetime. 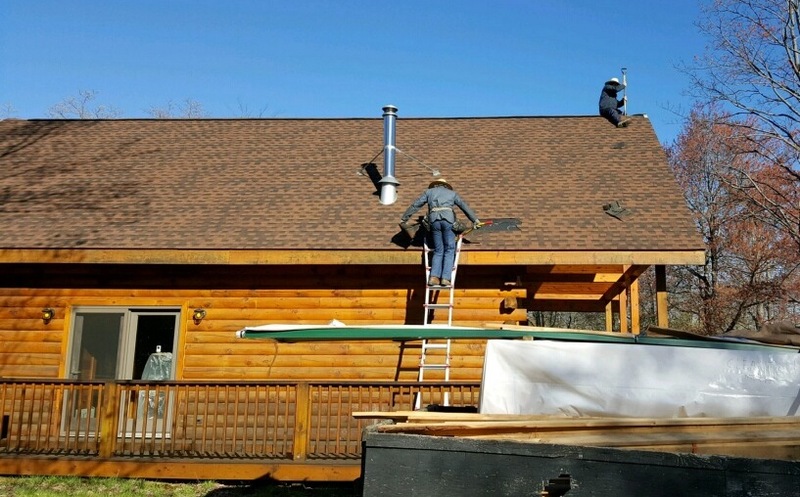 Tin lasts much longer than shingles and is a much cleaner material. Finally, a real mountain fresh cabin with true clean air.